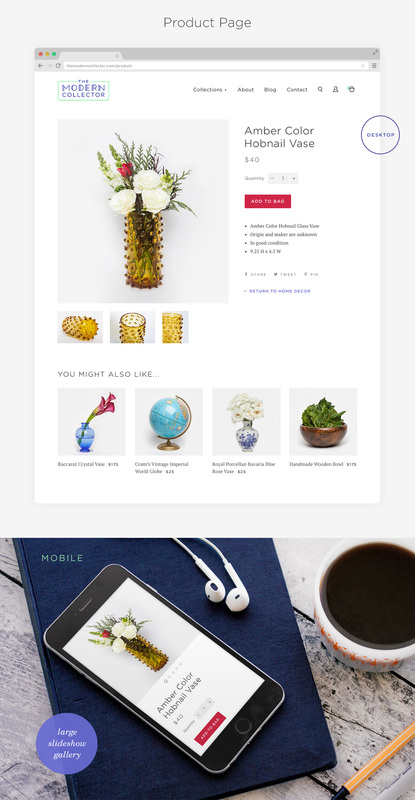 The Modern Collector is a unique lifestyle brand featuring new and vintage home decor, limited edition artwork, and antique jewelry. The Modern Collector believes the home should tell the story of each individual. They restore pieces with history, character, or charm to their original greatness, and were born from the desire to empower everyone to create a space and style all their own. They thoughtfully select each piece based on design, craftsmanship, and usability. A bold splash of color, a quirky piece of art, historic relic, or interesting design. Each of these special nuances tell a story, and becomes quite beautifully modern when put in the right environment. With all of this in mind, we got to work on the branding and logo. It was incredibly fun to work on, a true creative exploration. 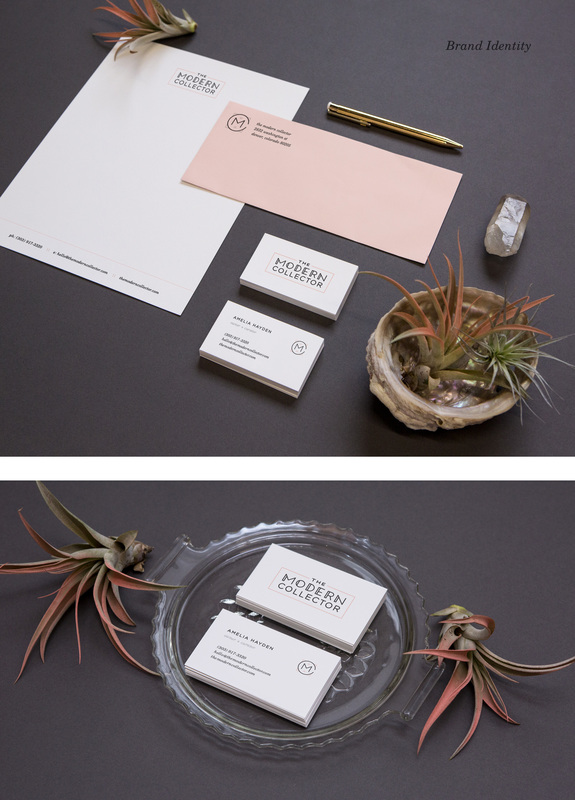 We tried several different avenues, but landed on a clean, bright, modern concept for the logo and style. A custom, geometric typeface with Art Deco style nods and really bold color palette to set it apart. We also created the MC icon as a support piece. This site is built on the Shopify ecommerce platform. The Modern Collector shop is a reflection of the brand style with an emphasis on the product photography. The cleanliness of the type & design allows the large, beautiful images to shine. 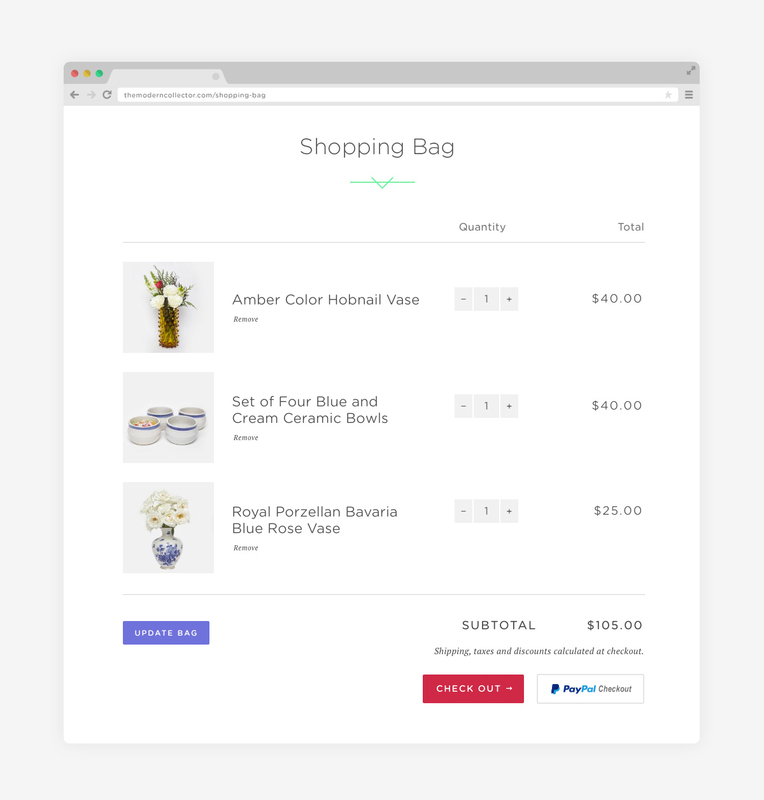 Built-in functionalities like the quick cart and a fully responsive design makes shopping fast and easy on all devices. The product detail page was designed with readability and functionality in mind. The desktop product page features large images with a on-click zoom feature that opens a full screen slideshow. Additionally the product details section is “sticky” allowing the viewer to scroll through the images while the details remain fixed on the side. On the mobile product page, the images become a full screen slideshow and the viewer can swipe through the images. The page content stacks nicely and scales seamlessly. With most online shopping starting on phones, it’s important to have a product page that is readable when scaled for mobile. Social sharing and related items have also been incorporated into the design. Corresponding with the overall design aesthetic, the product pages and shopping bag are open and clean with large, modern type and images. The Modern Collector Blog is not just a creative outlet for founder Amelia Alpaugh. 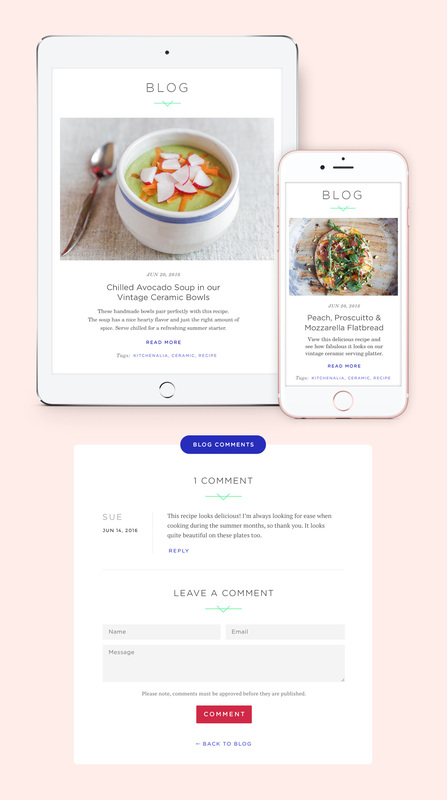 She has a fabulous eye for detail and features home design inspiration, ideas, resources, recipes, and news in addition to other designers and artists. As with the product imagery, we let the photography shine here with a sleek, clean design. Featuring craft goods, art, fashion, food (and beer of course) from over 100 local vendors. City Park, August 2016. Flea is Denver’s largest summer market with more than 20,000 attendees. 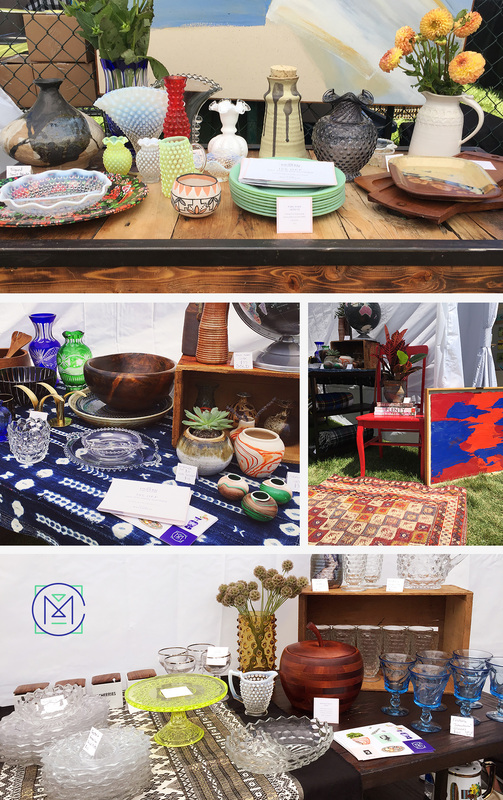 Being the Modern Collector’s first event, our goal was to raise local awareness not only with the market-goers, but also amongst the talented regional makers. 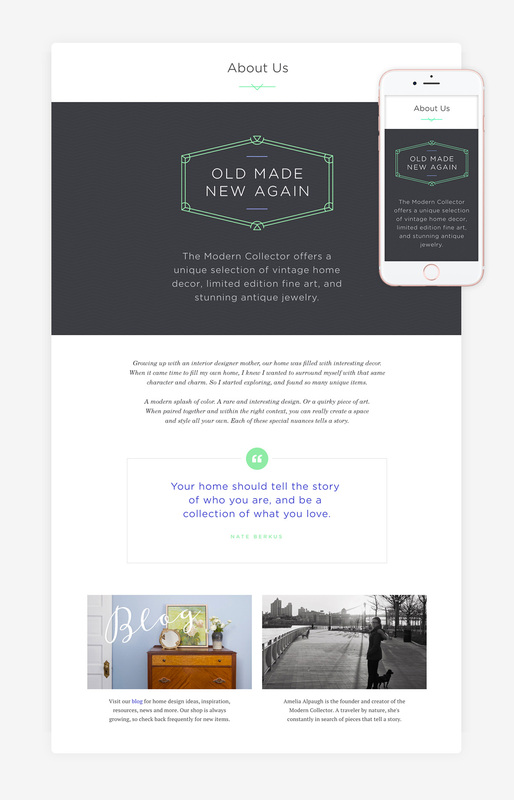 We launched an online and print campaign to drive new site traffic. The result has been a 25% increase in traffic since the event… with some new partnerships to come.